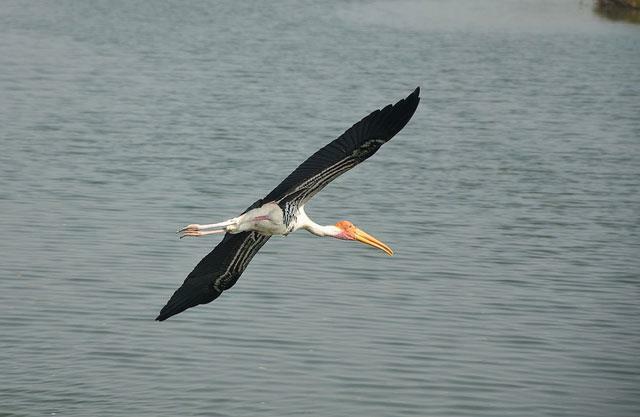 The Vedanthangal bird sanctuary is one of the most popular bird sanctuary in Tamilnadu. A variety of migratory birds visits this place every year. 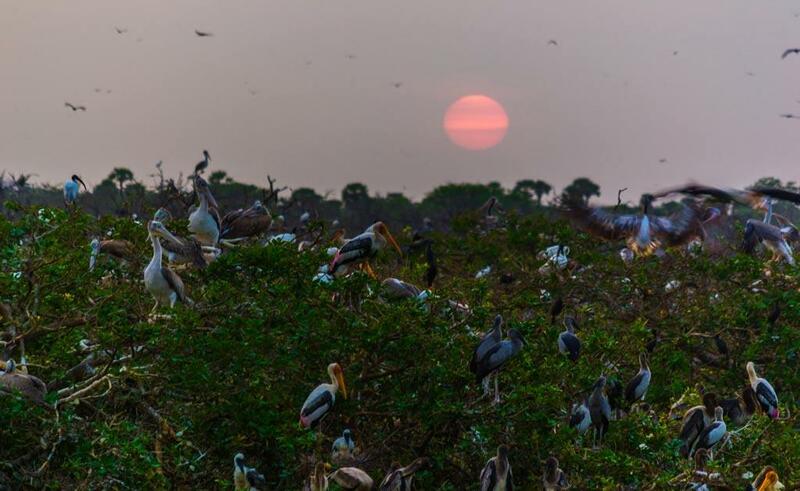 Here is the information on Vedanthangal bird sanctuary season, timings, how to reach, entry fee, and the best time to visit to make your trip easier. The Vedanthangal bird sanctuary is the smallest bird sanctuary in India situated near to the small town of Padalam in the Kancheepuram district in the state of Tamil Nadu. But this oldest sanctuary carries an amazing history behind it. The sanctuary is preserved by the local people for over 250 years as they have found that the water that contains birds' muck mixed with it can prove as best natural fertilizer for the crops. The place was granted the legal protection in 1798 and in 1936 it was declared as a bird sanctuary. Later in 1972, under the wildlife protection act, the place was declared as a wildlife sanctuary. Every year during Vedanthangal bird sanctuary season around 30000 birds visits this area. Around 115 spices of birds have to be recorded at the Vedanthagal bird sanctuary. The birds like herons, egrets, storks and spoonbills visit here every year. Vedanthangal bird sanctuary is completely dependent upon the rainfall and faces water problems during the summer season. This is the reason why permanent water plants cannot be seen here. The Barringtonia trees are found here, which are used by the variety of birds for nesting purposes. The sanctuary has a lake with lots of trees in the water. Many birds can be seen on water and on trees Open-billed storks are the main visitors of Vedanthagal bird sanctuary. These birds breed twice during one season. Along with it, rare birds like painted stork, cormorant, Darter, Black-headed Ibis, Grey Heron etc are also seen here in large number. Water birds like Ibis, night heron, comb duck, dabchick, stilt, redshank, sandpiper, curlew etc capture the attention of many tourists during the season. Along with it, arboreal birds are commonly found here. The raptors like the variety of kites and eagles can be seen in Vedanthangal sanctuary. Along with the variety of birds, you can also see the mammals like jackals, jungle cats, wild boars, and the black-naped hare. When you enter the sanctuary you can enjoy the sight of plentiful trees full of beautiful birds. These birds are very much familiar with the visitors and don't get afraid when you take their photographs. The birds visit this place from their original habitat, thousands of km away from Australia, Pakistan and Bangladesh. The bird sanctuary is located in the area of 74 acres and it is better to visit it during the months of October and March to see the nesting birds. The Vedanthangal bird sanctuary is located at the distance of 75 km from Chennai on National highway. The Vedanthagal bird sanctuary is the best place for nature and wildlife lovers. Chennai is the nearest airport to reach the place which is around 58km away. If you are coming by rail then Chengalpattu is the railway station, which is around 30km away from the place. Trains from Delhi, Mumbai and Chennai reach here daily. To reach the place by road from Chennai, you need to come through national highway no. 45 and come towards Padalam Junction. You can also reach the sanctuary from Kanchipuram and Mahabalipuram. Bus services are available to reach the place from the city of Chennai, Mahabalipuram, and Chengalpattu. The climate of Vendanthagal bird sanctuary is very hot and humid during the summer season that is from the months of March to July. But the weather is cool and pleasant during the winter season. The months from August to October are monsoon months and heavy rainfall is noted during this period. Due to heavy rain, this period is not advisable for bird watch and nature photography. If you wish to visit Vedanthangal bird sanctuary the best season is from the month of November to March. This period is the nesting season for migratory birds and you can enjoy seeing a lot of common and rare birds here. Also, the weather remains enjoyable during this time. You can plan a family picnic during the weekend to this amazing place. The place is well structured with paved paths and watchtowers and benches for the bird watchers. You can take a close view of the bird activities from here. Visitors are advised not to disturb the birds and stay quiet in the corner to watch every activity of the birds. Karikili bird sanctuary is another place of attraction at the distance of just 9 km from Vedanthangal sanctuary. People visit here early in the morning for bird watching. Sanctuary is well maintained for the safety of the birds and animals. You can get fruits, tea or coffee, soft drinks and snacks outside the sanctuary. An interpretation centre is located at the gate of the sanctuary. In this centre, they provide you with the facility of the tourist guide who can provide you information about the place and the birds. The place is very crowded during the weekends, so if you wish to spend a relaxing time at the place, it is advisable to visit during the weekday. You can visit the sanctuary any time from sunrise to sunset that is from 6am to 6 pm. If you are a bird lover then don't forget to carry your pair of binoculars, camera and bird book to enjoy the great experience. The entry fee to enjoy this oldest bird sanctuary in the nation is only Rs. 25 per adult and Rs. 5 per child. The parking charge of the place is Rs. 10 and the camera fee is Rs. 25 only. Timings to visit is 6AM–6PM. Me and my friends visited this Vedanthangal Bird Sanctuary in mid-February. As a birds lover and a natural photographer, it was an awesome trip. Is Vedanthangal Bird Sanctuary open on Sunday? Please help me. We are planning to visit on a Sunday if it is open on Sundays. Is it a good time to visit in June or July? Is there any accommodation available in Vedanthangal? Please give details of all hotels and resorts available in Vedanthangal. Vedanthangal is not in a commercially developed locality and there is no hotel or resort nearby.